Built-in wind/rain curtains convert into awnings for additional space. 4 pole square umbrella screen house sized to fit a picnic table inside or beneath awning Quality, shockcorded 7/8" - 1" aluminum frame is longer lasting and offer better performance in wind and rain than fiberglass UV resistant 150D StormShield� polyester splash cloth and roof is longer lasting than 75D polyester for maximum use 50D polyester no-see-um mesh wall panels. Eureka! hub and ring and pin assembly offers easy set up Vertical side walls maximize interior space; 64.5 sq ft of awning covered exterior space on each side 2 full length doors zip completely open and out of the way for easy entry and exit Built-in wind/rain curtains on all 4 sides double as awnings when extra space is needed; 1 set of poles is included Optional snap-in floor sold separately. 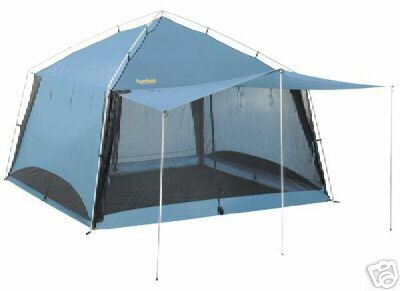 Part # 083826263002 Seasons: 3 Sleeps: N/A Doors: 2 Windows: Full Mesh Panels Weight: 28 lbs. Area: 144 Sq. Ft. Center Height: 8' 5".